Sets the filter regular expression flags. Returns the filter regular expression flags. 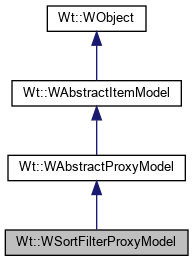 A proxy model for Wt's item models that provides filtering and/or sorting. This proxy model does not store data itself, but presents data from a source model, after filtering rows. It also allows sorting of the source model data, without actually altering the source model. This may be convenient when the source model does not support sorting (i.e. does not reimplement WAbstractProxyModel::sort()), or you do not want to reorder the underlying model since that affects all views on the model. To use the proxy model to filter data, you use the methods setFilterKeyColumn(), setFilterRegExp() and setFilterRole() to specify a filtering operation based on the values of a single column. If this filtering mechanism is too limiting, you can provide specialized filtering by reimplementing the filterAcceptRow() method. Sorting is provided by reimplementing the standard WAbstractItemModel::sort() method. In this way, a view class such as WTreeView may resort the model as indicated by the user. Use setSortRole() to indicate on what data role sorting should be done, or reimplement the lessThan() method to provide a specialized sorting method. By default, the proxy does not automatically refilter and resort when the original model changes. Data changes or row additions to the source model are not automatically reflected in the proxy model, but to maintain integrity, row removals in the source model are always reflected in the proxy model. You can enable the model to always refilter and resort when the underlying model changes using setDynamicSortFilter(). This returns the number of columns at index parent. Returns whether this proxy dynmically filters and sorts. Returns whether a source row is accepted by the filter. The default implementation uses filterKeyColumn(), filterRole() and filterRegExp(). You may want to reimplement this method to provide specialized filtering. Return the column on which the filtering is applied. Return the regular expression used for filtering. Return the data role used for filtering. When implementing this method, you can use createIndex() to create an index that corresponds to the item at row and column within parent. If the location is invalid (out of bounds at the parent), then an invalid index must be returned. The rows are inserted in the source model, and if successful, also in the proxy model regardless of whether they are matched by the current filter. They are inserted at the indicated row, regardless of whether this is the correct place according to the defined sorting. As soon as you set data for the column on which the filtering is active, or which affects the sorting, the row may be filtered out or change position when dynamic sorting/filtering is enabled. Therefore, it is usually a good idea to temporarily disable the dynamic sort/filtering behaviour while inserting new row(s) of data. The default implementation uses sortRole() and an ordering using the operator< when the data is of the same type or compares lexicographically otherwise. You may want to reimplement this method to provide specialized sorting. An implementation should use createIndex() to create a model index that corresponds to the parent of a given index. Note that the index itself may be stale (referencing a row/column within the parent that is outside the model geometry), but its parent (identified by the WModelIndex::internalPointer()) is referencing an existing parent. A stale index can only be used while the model geometry is being updated, i.e. during the emission of the corresponding [rows/columns](Being)[Removed/Inserted]() signals. The rows are removed from the source model. This returns the number of rows at index parent. Configure the proxy to dynamically track changes in the source model. When enable is true, the proxy will re-filter and re-sort the model when changes happen to the source model. This may be ackward when editing through the proxy model, since changing some data may rearrange the model and thus invalidate model indexes. Therefore it is usually less complicated to manipulate directly the source model instead. Specify the column on which the filtering is applied. This configures the column on which the filterRegExp() is applied. Specify a regular expression for filtering. This configures the regular expression used for filtering on filterKeyColumn(). The default value is an empty expression, which disables filtering. Specify the data role used for filtering. This configures the data role used for filtering on filterKeyColumn(). The default value is DisplayRole. Sets header data for a column or row. Specify the data role used used for sorting. This configures the data role used for sorting. Sorts the model according to a particular column. If the model supports sorting, then it should emit the layoutAboutToBeChanged() signal, rearrange its items, and afterwards emit the layoutChanged() signal. Returns the current sort column. When sort() has not been called, the model is unsorted, and this method returns -1. Returns the current sort order. Return the data role used for sorting.